Labour councillors have submitted a member’s item to the 26 June Housing Committee calling for a review of fire safety at all Barnet Homes properties and housing association properties located in the borough following the fire at Grenfell Tower in North Kensington. Facebook event here: Monday, June 26 at 6 PM at Hendon Town Hall. Barnet activists join this protest on Saturday: Look for our banners! Barnet Housing Action Group stand in solidarity with the residents of the Grenfell Estate, the dead and the living! Our hearts are with them and words cannot truly express how saddened we are at the news of the tragic loss of so many loved ones in their community. Our thoughts and prayers are with you during this tragic time. We are humbled by the actions of the local community and those that have travelled to provide support; a rainbow of people of colours, ethnicities, origin and faith, they are the true heroes , together with the professionalism and bravery of the rescue services. We salute you all !! We are shocked and appalled that not one of Barnet’s Conservative MP’s as have yet posted messages of sympathy or support in the press or social media and that our newly elected Prime Minister did not take time to speak with or console residents in their grief whilst visiting yesterday. Who are the dead? Working class and diverse communities – in Kensington – the Richest borough in London ! IN THE 5TH RICHEST COUNTRY IN THE WORLD! Will we ever know. The fire reportedly started on the 4th floor of a 24 storey block containing a 120 flats. How many per flat? How many sub-let? How many HMO’s? How many sofa surfers resided in this block? Average of say 5 per flat = 600 residents……. We reiterate the statement made yesterday from Sophie Khan solicitor for the victims of the Lakanal House Tower Block fire in Camberwell in 2009 ‘a public inquiry is NOT the right way forward – Residents should be ‘demanding an INQUEST from the Government’ !! Although not directly pertaining to the tragedy of what has occurred at the Grenfell Estate We also note that Jeremy Corbyn attempted to pass a law to require private landlords to make their homes safe and ‘fit for human habitation’ last year but it was rejected by the Conservatives – 72 of whom were private Landlords. Private renters in Barnet should know that both Theresa Villiers, MP for Chipping Barnet , and Mike Freer, MP for Finchley and Golders Green – a private landlord himself, chose to vote against the amendment. As a member group of the Radical housing network we support the call for the immediate resignation of Gavin Barwell , Theresa May’s chief of staff, ex minister for housing , whom it has been revealed ‘sat on a report warning that tower blocks were vulnerable to fire.’ Barwell also voted against the amendment to make homes fit for human habitation! And also reiterate the statement that ‘this government, – – – have neglected council housing , and treated tenants as if they were second class. Nationally and locally , politicians have subjected public housing to decades of systematic disrepair and open to privatisation. Regeneration , when it has come , has been for the benefit of developers and buy to let landlords, who profit from luxury flats built in place of affordable homes. and which we believe should be brought back under council control. The same cladding on Grenfell Tower is on a Barnet block of flats and businesses, it has been revealed.East Sussex company Harley Façade Ltd and its main contractor, Rydon, completed work on commercial building Merit House, Edgware Road between 2013 and 2015, adding the same waterproof cladding that wrapped Grenfell Tower..
Barnet Housing Action have been campaigning about these issues since 2013 in Barnet, and have seen the systematic destruction of our public housing in the borough – on the West Hendon, Dollis valley Grahame Park and Stone Grove estates, where council housing stock has been depleted resulting in a net loss of 827 council homes for social rent! But we as the voices of the residents and housing campaigns NEED TO FIGHT TO ENSURE that they are replaced – with decent, genuinely affordable, PUBLIC housing which are homes for the residents that were living there!!! We call for a moratorium on regeneration on all London estates until more is known about this horrendous tragedy as it seems apparent that it was caused because of ‘regen improvements’. This tragedy MUST not be allowed to be an opportunity for those with power to socially cleanse the area – to gentrify with luxury homes for the rich and residents to be dispersed all over the country like pieces of furniture !!! The block is no doubt surrounded by empty “luxury apartments” which ought rightfully to be put to good use to house the newly homeless, bereaved former residents. It’s tragic that it’s come to this, but from the ashes we hope we can move forward to a time and a place where all lives truly do matter, over profit, over money, over greed. Grenfell Action Group outlined concerns on their blog over a series of posts, but were ignored by authorities. 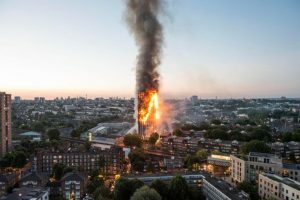 The group repeatedly warned the estate landlord, Kensington & Chelsea Tenants Management Organisation (KCTMO) of serious issues with fire safety in the blocks, highlighting the absence of basic fire protection measures including fire extinguishers and a building-wide fire alarm system. The local council, Royal Borough of Kensington Chelsea (RBKC), dismissed residents’ concerns as it pushed through a £8.6 million regeneration scheme. 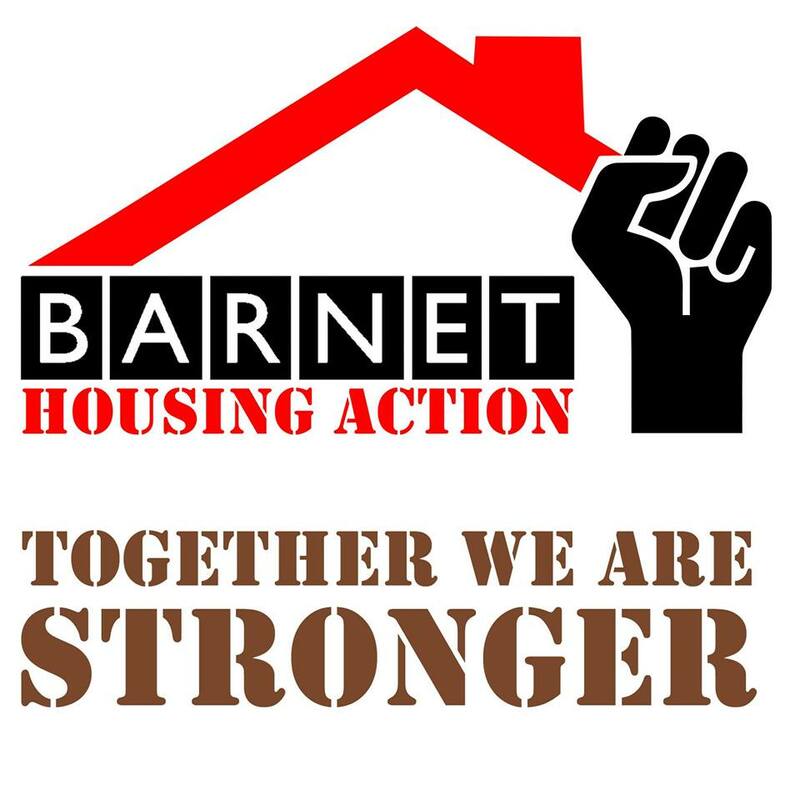 Barnet Housing Action Group are an umbrella campaign which includes Our West Hendon and Sweets Way Resists, and are a member of the Radical Housing Network. The member’s item from Cllr Ross Houston, the Labour Group Housing Spokesperson and Deputy Group Leader, also asks the Committee to look at what Barnet Council can and should be doing to ensure private blocks of flats have robust fire safety arrangements in place. Cllr Ross Houston said: “Our thoughts and prayers are with all the people who are affected by this terrible fire at Grenfell Tower. Read full story at Barnet Labour website. Join the demonstration tomorrow (Friday 16th of June) at the Department for Communities and Local Government. Radical Housing Network, a London-wide alliance of groups fighting for housing justice, said the Grenfell fire was a tragic consequence of systematic disinvestment in council housing alongside disregard for council tenants safety and their concerns – and called for #JusticeforGrenfell. The catastrophe at Grenfell Tower was foreseen by a community group on the estate. Just 7 months ago, Grenfell Action Group, a member of Radical Housing Network, warned that failings in the estate management organisation’s health and safety practices were a “recipe for a future major disaster”. These warnings were dismissed by Royal Borough of Kensington & Chelsea (RBKC) council. It’s been revealed that Gavin Barwell, Conservative Chief of Staff and ex-Minister for Housing, ‘sat on’ a report warning that tower blocks were vulnerable to fire. Last year, Barwell was one of 312 Tory MPs who voted against making properties ‘fit for human habitation’. Radical Housing Network called the fire a horrendous example of the consequences of a combination of government cuts, local authority mismanagement, and sheer contempt for council tenants and the homes they live in – and an indictment of London’s stark housing inequality. “The fire at Grenfell is a horrific, preventable tragedy for which authorities and politicians must be held to account. 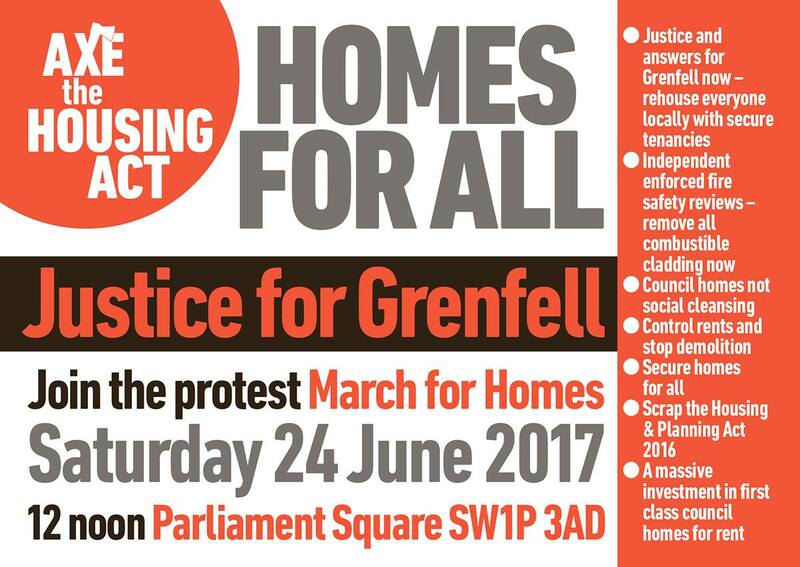 Grenfell’s council tenants are not second class citizens – yet they are facing a disaster unimaginable in Kensington’s richer neighbourhoods. “This Government, and many before it, have neglected council housing, and treated tenants as if they were second class. Nationally and locally, politicians have subjected public housing to decades of systematic disinvestment – leaving properties in a state of disrepair, and open to privatisation. Regeneration, when it has come, has been for the benefit of developers and buy-to-let landlords, who profit from luxury flats built in place of affordable homes. Across London, regeneration has meant evictions, poor quality building work, and has left tenants with little influence over the future of their estates. “The chronic underinvestment in council housing and contempt for tenants must stop. It is an outrage that in 21st Britain, authorities cannot be trusted to provide safe housing, and that people in council properties cannot put children safely to bed at night. 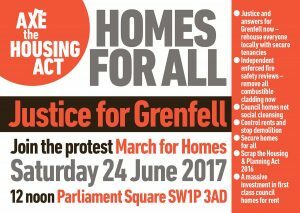 “We support demands for a public inquiry into this disaster – there must be Justice for Grenfell. We call for the immediate resignation of Gavin Barwell, Theresa May’s Chief of Staff, alongside anyone else whose negligence has contributed to this tragedy. Radical Housing Network is a London-wide network of campaigns fighting for housing justice. Grenfell Action Group is a member group of RHN.